Boil some water and soak cashew nuts for 15 minutes until soft. Strain excess water and set nuts aside. Add the dates to a blender and mix into small pieces and place in a small bowl. Next add almonds and process into a very small meal. Add dates, coconut oil and salt into the almond meal and blend ingredients on high speed until a soft dough is formed. Grease a muffin tin, and press the cheesecake base into the bottom of the muffin tin. Use a small glass to smooth out the base. Place this tin in the freezer when preparing the filling. Add cashew nuts, lemon juice, coconut oil, coconut milk and maple syrup to a blender and mix until a smooth paste is created. Pour filling on top of the bases in the muffin tin. 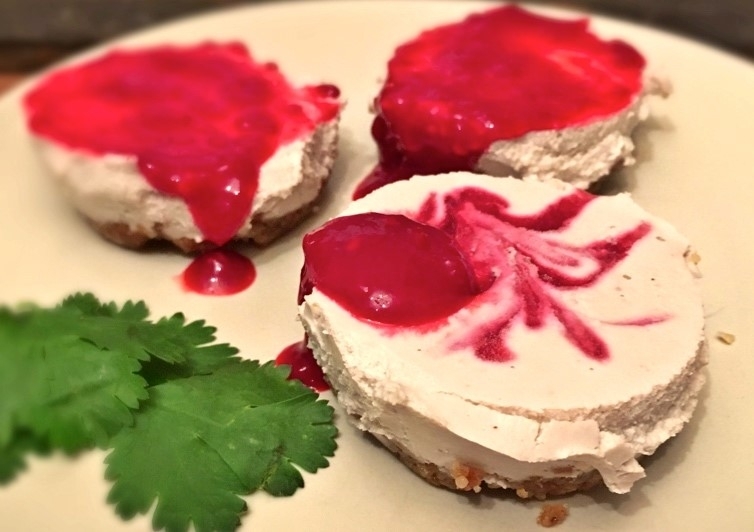 Swirl raspberry coulis on top of the filling and place in a freezer to set, allow 2-3 hours for the cheesecake to set. Garnish with mint and add extra coulis when ready to serve.